Siegmund Excavation's new Cat 552 feller buncher for steep-slope logging. Safety and productivity is the mantra of Siegmund Excavation and Construction. We accomplish that goal with skilled, hard-working employees and innovative equipment, like the Cat 552 feller buncher that we recently acquired for our steep-slope logging operation. Siegmund’s full-service logging operations rely on the steep slope tracked feller buncher for felling timber ahead of our logging crews. 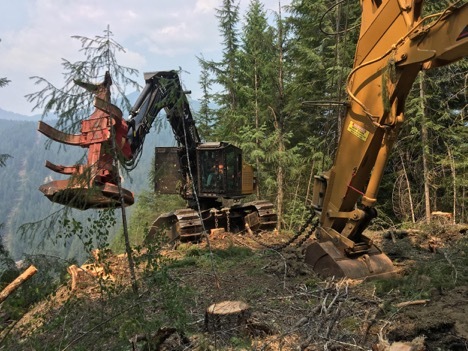 It’s a tough job on any terrain, but it becomes significantly more difficult when working on steep slopes.Steep-slope timber harvesting technology and methods is a new practice in the Pacific Northwest. We carefully researched the effectiveness and safety of a machine that would operate in hard-to-access terrain. After having researched the work that was already being accomplished in New Zealand, our understanding of steep-slope logging expanded and we grew to appreciate this new technology. We saw the benefits and safety that come with a piece of equipment that is more efficient, doesn’t require men on the ground, and most importantly, is an overall safer option for our crews. 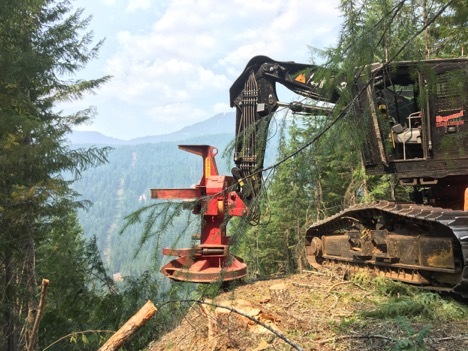 Steep-slope timber harvesting technology and methods is a new practice in the Pacific Northwest. We carefully researched the effectiveness and safety of a machine that would operate in hard-to-access terrain. After having researched the work that was already being accomplished in New Zealand, our understanding of steep-slope logging expanded and we grew to appreciate this new technology. We saw the benefits and safety that come with a piece of equipment that is more efficient, doesn’t require men on the ground, and most importantly, is an overall safer option for our crews. The Cat 552 is a great addition to our equipment inventory. Its Series 2 track feller bunchers provide our operators a smoother hydraulic performance and better visibility in from a comfortable operator station which includes a full-suspension seat with 4 point harness. It’s a fuel-efficient, full-tail swing machine that’s designed for high production clear cut and clear or select cut work, with a leveling feature that makes it more secure and comfortable to work on steep and rough terrain. 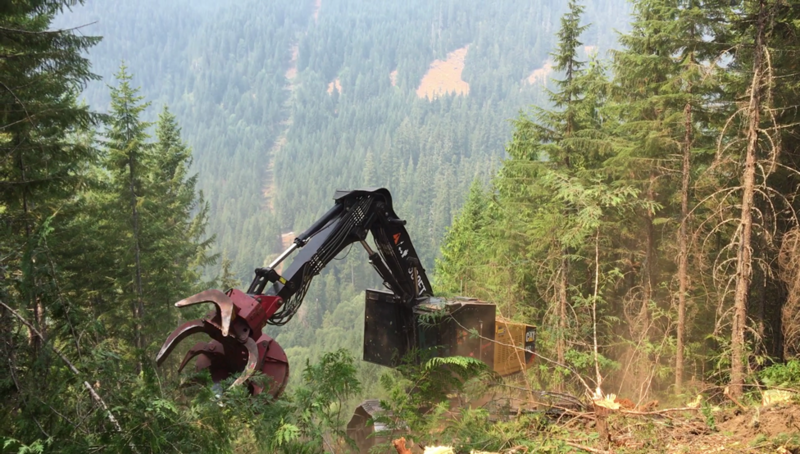 All that muscle was put to the test last summer when our steep-slope logger was called into action during the Whitewater wildfire as it devoured over 14,451 acres around the Mount Jefferson Wilderness. In an effort to control the direction of the fire, Freres Lumber Co. and the Oregon Department of Forestry (ODF) needed to build a fire-line at the point where the Wilderness joined private land. In coordination with these agencies, we put our team to work, cutting a line in the forest in less than three days, far ahead of what a hand crew could have accomplished in such treacherous terrain. This also marked the first time a tethered feller-buncher steep-slope operation had been used in fire suppression efforts in the country. In purchasing the steep-slope logger Siegmund Excavation and Construction has furthered our commitment to increasing productivity, while maintaining the safe working environment we continue to champion in Oregon’s busy timber industry.